The first biography of the iconic woman whose name stands for good manners, Emily Post tells the story of a woman who steadfastly recorded the shifting, tumultuous historical epochs that shaped her - and that she helped shape. From the excesses of the late 19th-century Gilded Age, through the horrors of World War I, to the transformations of the Roaring 20s that gave birth to her magisterial Etiquette, Emily Post unfailingly took the measure of her era. A Baltimore blue blood with a populist heart, she helped the masses live the American dream with her hugely popular book, which has been continuously in print for over 85 years. ©2008 Laura Claridge (P)2008 Blackstone Audio, Inc. While I loved reading this book, and getting to know a little more about Emily Post life since I grew up hearing about her. This book is much like Emily post was in some ways. I have not read much about this particular time period, but this was a great peek into the lives, loves and losses of Emily Price Post and her peers. 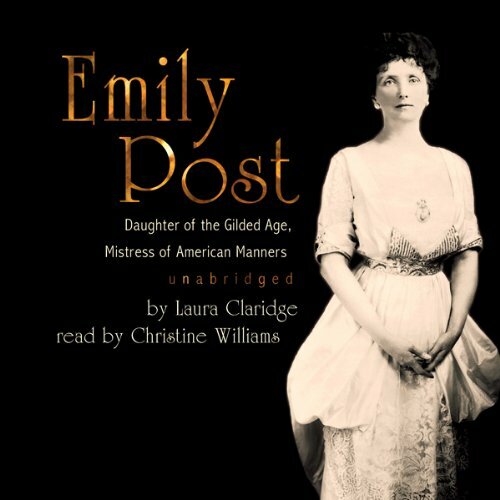 Would you consider the audio edition of Emily Post to be better than the print version? Yes, but only because I prefer audio over print. This book would be enjoyable in either, 'tho the print version probably weighs a ton! The revelations about the true meaning of the word "etiquette". That sounds boring but believe me it is not. This story starts out well and gets better and more interesting as it unfolds. Great research! I can't seem to do justice to this book. It is one of my top tens, if you like the gilded age and enjoy reading the lifestyle of the rich and famous, you will love this. But there is much more to it. It really is a social history and a fascinating one. The 1922 Emily Post Etiquette is available on Kindle (very inexpensive) and is a fascinating read after listening to this book, especially when you contrast it with the current Emily Post which is still being revised and published by the Emily Post Institute. This book captivated my attention. I never tired of her voice. Christine did an awesome job. She could speak the French words and phrases like a native. The movie "Gatsby" began to spark my interest in the Gilded Age so I find Emily's life and experiences fascinating. I wish Audible's inventory included books authored by Emily Post. ...especially Emily's connection with architecture. She was not a trend-follower, but a trend-setter who believed that "etiquette" was all about making others feel comfortable. The narrator was good, but mispronounced some names and words which she should have looked up if she was unfamiliar with them. Very informative about a woman who was a household name when I grew up in the fifties. It also was very informative about a period in American history between the Civil War and World War I. I enjoyed this book thoroughly.